I am a mom to five precious children, and when I got pregnant with my last child, I was well on my way of sewing a handmade wardrobe. I have definitely learned what has worked best for me when it comes to dressing the bump and staying comfortable in pregnancy. 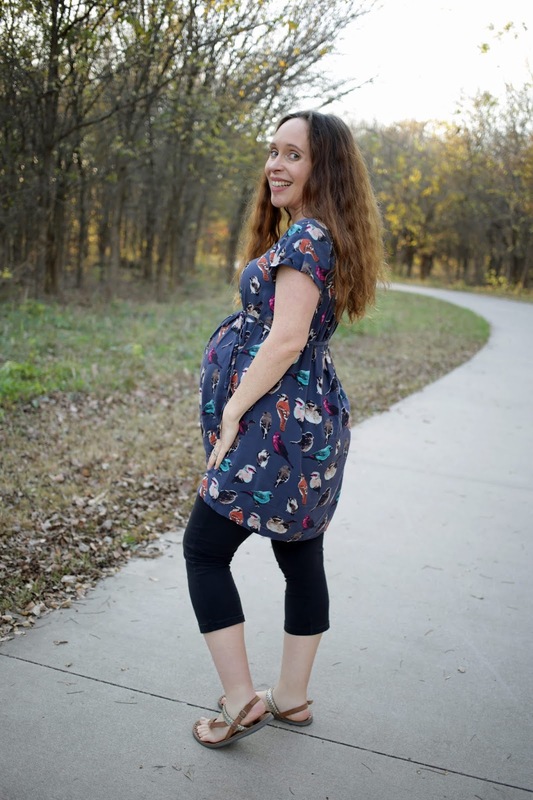 Today, I am excited to share with you a roundup of all the patterns that I enjoyed wearing the most over this past pregnancy. Surprisingly, most of my favorite patterns for pregnancy are not maternity patterns. I have broken this post down into two main categories: Tops and Bottoms. The patterns within each category are not in any special order. 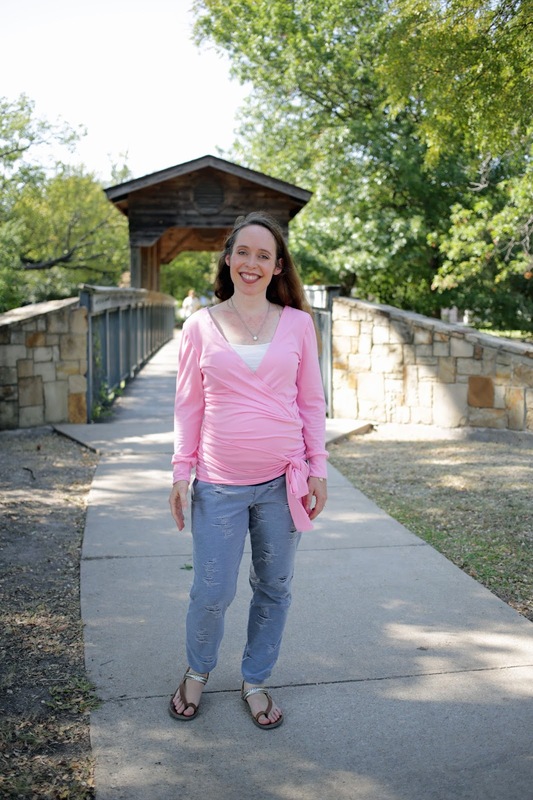 The LAVitality Wrap Top was a top that I made in my second trimester because it looked like it would be great for breastfeeding. I was due in January so I knew I needed some long sleeve tops that would be easy to nurse in. The pattern has a regular length and a longer length. I made the longer length, and the special surprise was that it ended up working great for maternity and was so nice for breastfeeding in once baby arrived. I blogged about this pattern here when I first made it. 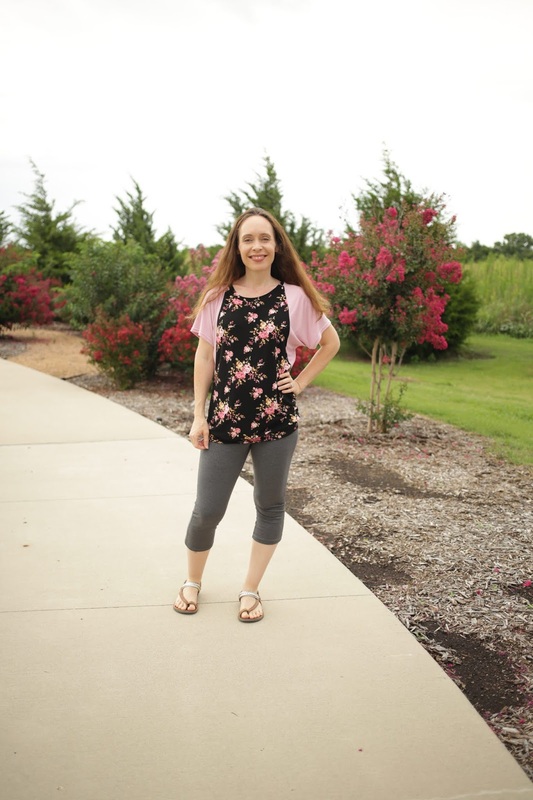 I never got around to blogging about this pink wrap top that I made using Simplicity 8424. I wore this at least once a week in pregnancy (once it was cool enough outside). I made View E and added 5 inches to the length and added extra to the ties. I planned on wearing it postpartum for easy nursing access. However, once my baby belly was gone, I felt it had too much fabric, and it swallowed me. I plan to shorten the ties back up and wear it again this upcoming fall. I wore a lot of Greenstyle Green Tees and Greenstyle Centerfield Raglans this past pregnancy. I used a really easy maternity modification to make them work for pregnancy, and then, once pregnancy was over, I un-modified them and am still wearing them. 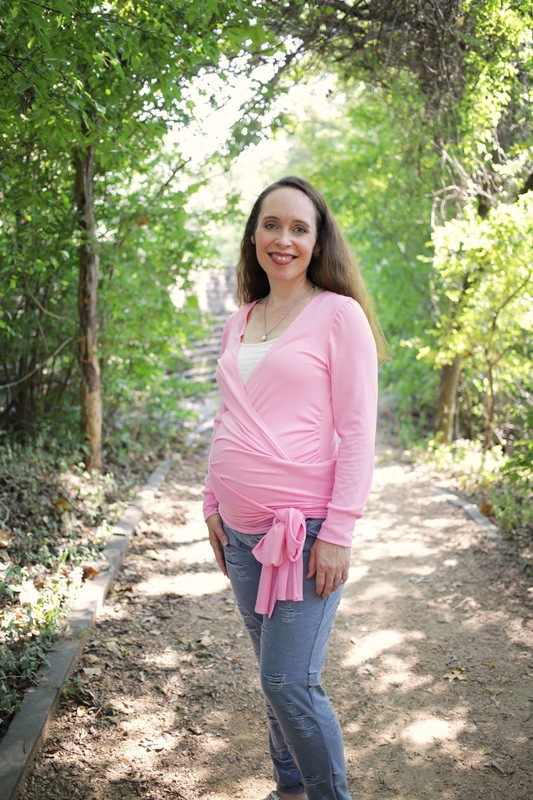 I blogged about how to hack a t-shirt pattern into a maternity top here. This black top is the Green Tee, which is free with a code in the Greenstyle Facebook group. This is the Greenstyle Centerfield Raglan I made using that hack. The first photo was early in my second trimester, and the next photo was at the gym in my 3rd trimester. The Hamburg Dolman by Shwin Designs is the one shirt that if I found out I was pregnant, I would make like 10 of them ASAP before first trimester exhaustion set in. This is not a maternity pattern, but in the tunic length using rayon spandex, it had all the room I needed until the very end. This top was extremely comfortable! 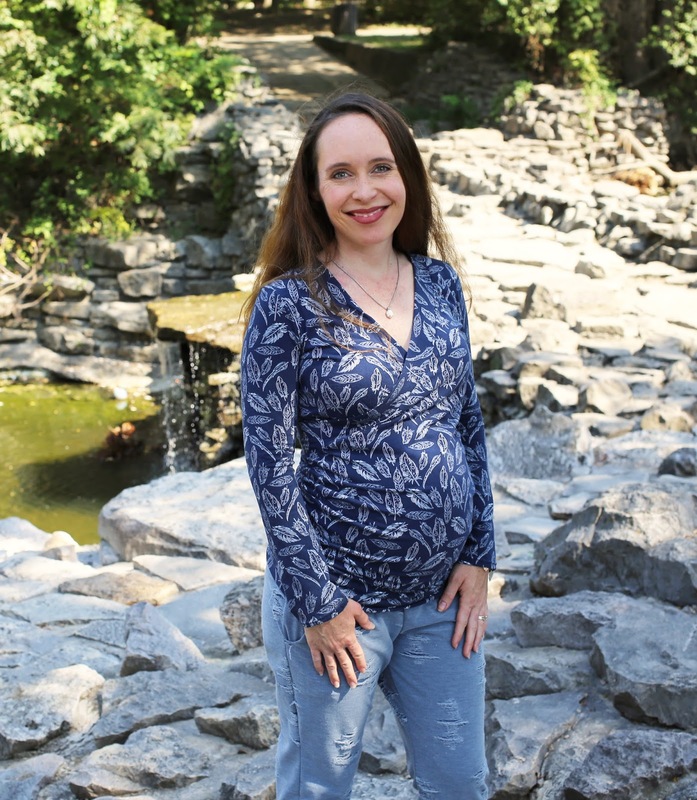 I have since given it to a friend who had no more room left in any of her maternity clothes and needed more tops that would last through the rest of her third trimester. The Stitched Upon a Time Spoxxy Top was also a favorite of mine. I wore this one to work out in or go on walks with my kids. I love the fun back detail on this top to use up pretty scraps. I had a bunch of Patterns for Pirates Pumpkin Spice Dolman Tops that I had made the winter before this pregnancy that fit me great during pregnancy. I was so happy that they fit so wonderfully when our weather turned colder. This is one in rayon spandex that I wore at 36 weeks pregnant. Here is another Pumpkin Spice Dolman in a loose weave sweater knit at 38 or 39 weeks pregnant. This pattern does not have to be made with the band, but I loved how the band at the bottom brought it in and made me look like I still had hips. 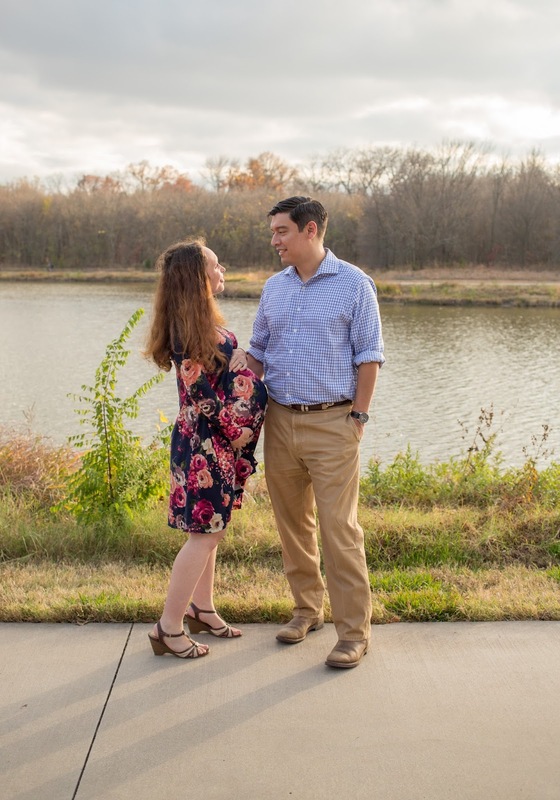 I wore my Greenstyle Scarlet Swing Dresses all the way to the end of this pregnancy. This is me at 32 weeks in a sweater knit swing dress. And here I am at 38 weeks in a brushed poly Scarlet Swing. I had no intentions of getting pregnant when I made these dresses so I used my not pregnant measurements and made these the winter before I became pregnant. Even though my bust size went up 4 inches during pregnancy, they still fit great. You can read my blog post that I wrote when I first made these dresses here. Simplicity 2147 is a very sweet woven dress that I made before pregnancy that just happened to fit (as a tunic) until the end of my pregnancy. I wore it all the time and blogged about it here. Leggings are the ultimate staple in every pregnant woman's wardrobe and for the postpartum period when your body is still adjusting to normal. I don't usually wear athletic tights when pregnant; rather, I am talking about pants that feel like pajamas while being stretchy and slim fitting so I can grow without realizing it. 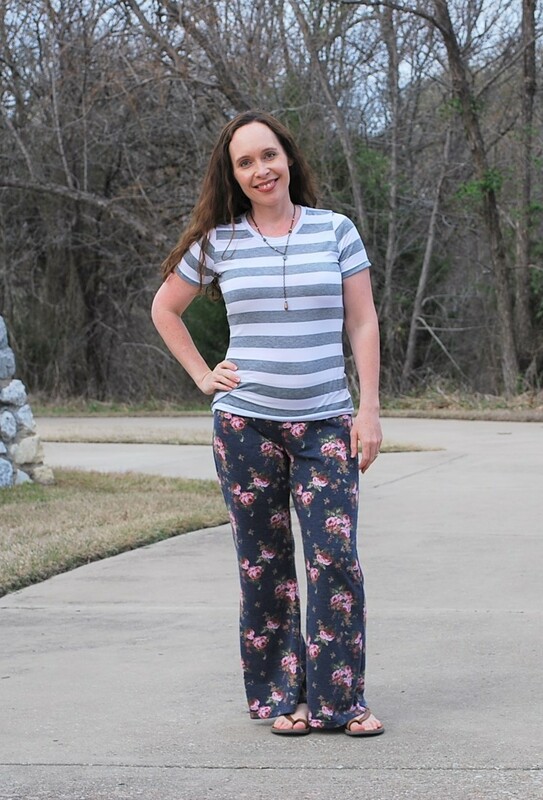 Two of my favorites were the Hey June Mountain Pose Pants, cut at capri length, and the See Kate Sew Capricorn Leggings with the maternity rise. The Mountain Pose Pants are flared at the bottom, but I cut them as a capri length and wore them as capri leggings. I made two pairs in cotton lycra, a solid black and a charcoal, and wore them constantly. The waistband was so comfortable on my growing stomach and the ease in the pants was perfect as my hips got wider as well. I blogged about the Mountain Pose Pants here when I first made them, and I was still wearing them here at 3 weeks postpartum. I did not make the See Kate Sew Capricorn Leggings until my 3rd trimester. I was a tester for this pattern and wished I had made a few pairs earlier in my pregnancy. Since I was in my 3rd trimester, though, I needed to go up a few sizes on the maternity waistband to get it all the way over my stomach. This floral is a cotton lycra as well. These pants are perfect for someone who prefers a band that goes over the belly. The Greenstyle Brassie Joggers are a huge staple in my wardrobe. I have made them out of so many different types of fabric to be suitable for so many occasions. I made a pair of Brassie joggers and shorts in the same distressed denim knit that I had gotten from Mily Mae just for this past pregnancy. They worked for pregnancy, and I still wear both of them now that I am back to my pre-pregnancy weight. They are truly a staple for me. You can read my initial blogpost on them that I wrote earlier in pregnancy here. I don't know how I never got a great photo of the Portlander Pants by New Horizons while I was pregnant, but I do have one of me still wearing them postpartum. I made the waistband out of supplex, and I made the waistband a little bigger than the pattern called for. These pants worked out great throughout my pregnancy. 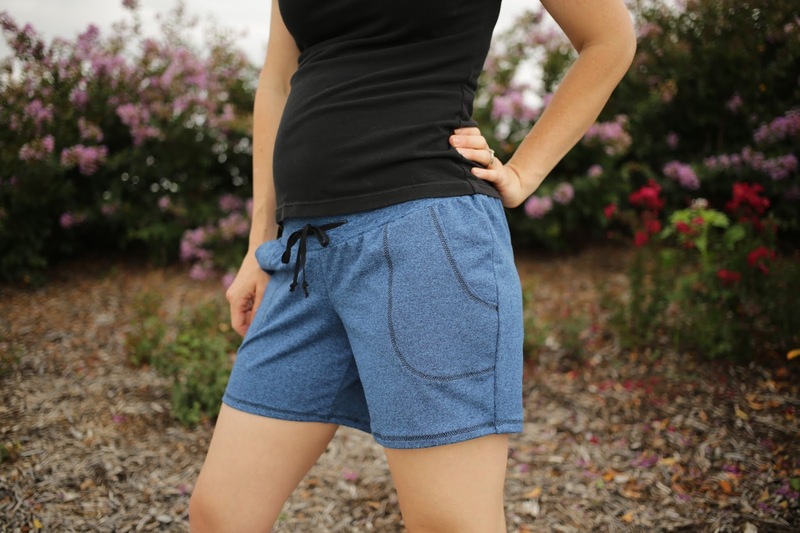 I was a tester for the Diane Joggers by 5 out of 4 patterns, and I wore the shorts, capris, and pants that I made during testing throughout my pregnancy. I used the maternity rise, and they all fit very well. Due to how low the front dips for the belly, though, they fell off of me once pregnancy was over so I have not worn them since. I am hoping that I can salvage some of them to wear in the future. Here is my initial blogpost on them. 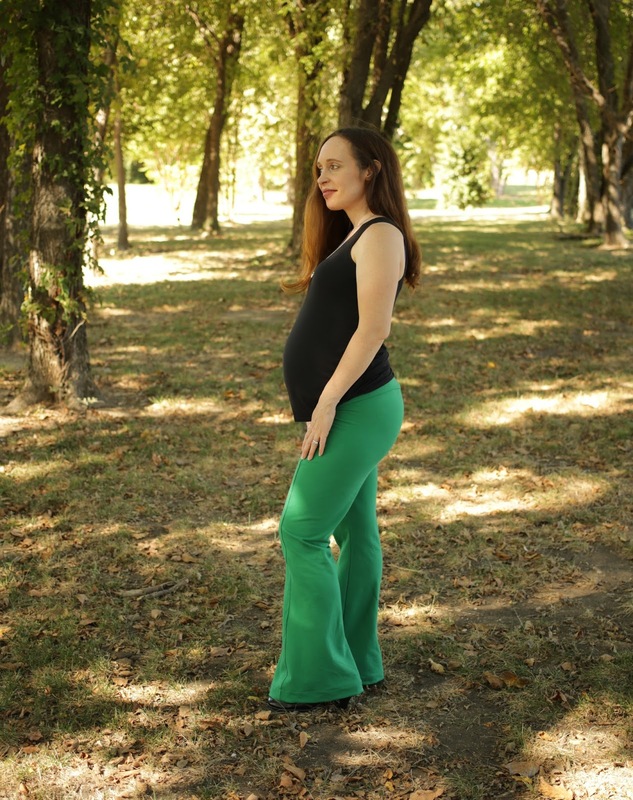 Last, but definitely not least, I loved wearing my Greenstyle Chelsea Pants this past pregnancy. I made the Chelsea's out of several different types of fabric during testing, and blogged about the pairs that I made here. The pair that I made out of a sturdy cotton French terry made it all the way to the end of pregnancy and felt like secret pajamas. I also got a ton of compliments every time I wore them and always felt put together in them. The knit waistband was also very comfortable postpartum. What did I not wear in pregnancy? Jeans. I cannot stand the feeling of a non-stretchy thick fabric pressing against my stomach when I am pregnant. 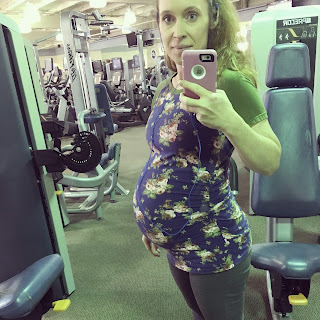 Even though maternity jeans have the stretchy waistband, my stomach couldn't handle the top part of the jean material where it met the stretchy fabric on my lower stomach. It hurt. SO BAD. So, that means that when sewing for maternity, I need the entirety of the fabric to be forgiving. So, if you make the Chelsea pants for pregnancy, stick to fabric with ample stretch, do not use stretch denim. I hope you enjoyed reading my maternity roundup, and I hope I have inspired you! You may follow me on Instagram or receive updates by liking my page on Facebook. If you want to take a look into the things that inspire me, you can follow me on Pinterest. Photo Credit: Many of the photos in this post were taken by my awesome friend, Aimee Wilson. If the lighting was off, or it looked like a cell phone selfie, then it was taken by me or one of my kids. This was awesome! Currently 27 weeks and trying to figure out which pattern I have that can be used with this big belly. This helped a lot. Great overview of many diffferent patterns! Yeah, maternity has been hard enough, I haven’t even started thinking about nursing clothes yet!